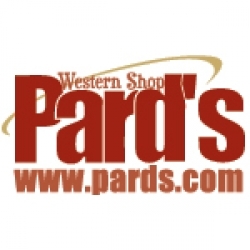 Quality and Service, the by-words of Pard's Western Shop. We, at Pards, are serious about providing quality merchandise and service to horsemen everywhere. Established in the fall of 1968, Pard's has grown from a very small tack store to a corporation with two stores, a catalog division, a mobile operation and a website servicing not only America's horsemen but the horsemen of the world. Over those 30+ years, we have realized that our success would depend upon our customers coming back year after year. Back then, our customers became our friends - they still are today. The quality of our merchandise has meant happy customers, but we have continued to go a step further offering assistance and service from our staff, who are experts in their areas.